Minkpaw sat at the entrance of Thunderclan camp. She needed to go on a patrol but she couldn't find Leafstorm to save her life. The old apprentice decided to wait on a Thunderclan warrior to see if they would take her on a patrol or something. She was sure others would join her even if she couldn't find a warrior. At this point other apprentices would do. Blackpaw wandered out of the apprentices' den only to find one of her denmates perched in the camp entrance. She couldn't quite remember her name. Something with an M. The sleek she-cat shrugged a little to herself, letting her curiosity get the best of her. Maybe the other apprentice was going on a patrol, in which case she wanted in. She padded up to Minkpaw, looking her up and down briefly. "Hello," she mewed. "Are you going on a patrol, or are you just sitting here for fun?" Minkpaw nodded biting back the urge to make a sassy remark back. "Yeah, I need to go on a hunting patrol, but I can't find my mentor so I decided to kind of start one myself." The rather large brown she-cat said to the other apprentice. "I would hope not just sitting here. This clan needs cats on their paws." Eaglepaw strode over. He had just returned from a patrol of the borders, and while his muscles ached, he was more than ready to head back out into the forest. The massive and muscular apprentice gave Blackpaw a nod. Although he barely knew the other she-cat, her sleek pelt caught his attention. And, of course, Minkpaw was there. Sootpaw's sister had always excelled where her brother failed. The tabby respected her for that and rather found himself enjoying her company. Although he held a certain disdain for cats with an impure lineage, she had been born into Thunderclan just like him and had certainly proved her worth. "Well, what are we waiting for? Let's get out there then." Without looking to gauge the response of the other apprentices, he headed through the gorse tunnel, charging on as the deadened twigs snagged his coat. Eaglepaw would likely smooth out his fur later, but for now getting things done mattered. Even if he was not the most talented at hunting, the apprentice would not be known for slacking. His claws were already unsheathed in the anticipation of the kill. For a moment, he merely went about in his task of deciding to lead the patrol of apprentices. However, he did pause for a second to cast a glance over his shoulder and check that the she-cats were behind him. Minkpaw let out a small growl as Eaglepaw basically showed up and took over her patrol. She nodded to Blackpaw before padding out of camp and shoving past Eaglepaw. "This is my patrol as I seem to recall. If anyone leads it, it's me." She told him with a slight growl on the edge of her voice. 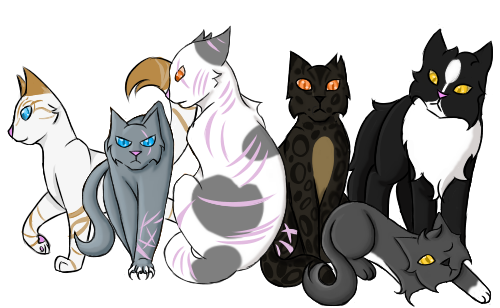 "We are going to head for the Skyclan border, Tatteredleaf said that is the best spot to find prey." She told the other two. The bulky brown apprentice leading the way towards the border. Blackpaw followed behind the two larger apprentices, keeping quiet. Their bickering was kind of annoying, it was clear to her that all of them together didn't have very compatible personalities. But she needed to go on a patrol, so by Starclan she was going on one. After a bit she strayed up closer to Eaglepaw and flicked her tail, having noticed he had his eye on her earlier. "SkyClan border sounds good," she mewed, keeping her bright yellow eyes forward. She didn't know either of them very well, as she had always felt distanced from the other Clan cats as she wasn't born into the Clan. Plus, she wasn't exactly the friendliest cat in the world. Maybe this was her chance to get to know the others.